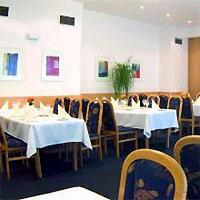 The hotel is located close to the city center, and it is close to shopping and entertainment. Those who stay at this accommodation in Prague will be just a short distance from many attractions such as Kafka Cemetery, the TV Tower, and historic sites in the Old Town area. Travelers will also find plenty of shopping and dining opportunities in the city. It takes only 30 minutes to drive to the international airport from the Quality Prague. All of the highways are easy to reach. Guests will find that the trams and other types of public transportation are near the hotel. They will also discover that some attractions are reachable on foot. Guests will find 244 rooms at the Quality Hotel Prague. All of the rooms have direct dial phones, satellite TV, hairdryers, mini bars, and private bathrooms. When staying at the Quality Hotel in Prague, guests will be able to dine at the onsite restaurant that serves Czech and international dishes. The hotel also has an onsite bar, a gift shop, and an Internet terminal in the lobby.